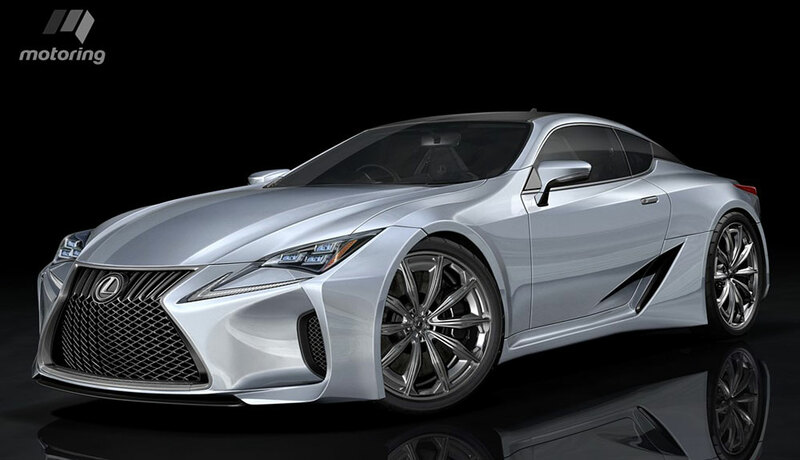 Lexus to Debut LC 500 and LC 500h Coupe at Detroit Auto Show? [The LC 500 will use] The same 351kW/530Nm 5.0-litre V8 propelling the RC F and GS F will most likely be married to a world-first 10-speed automatic transmission supplied by Aisin, which will aid performance efficiency. The LC 500h on the other hand, will employ an all-new 3.5-litre V6 ‘multi-hybrid’ for rear-drive models, that will also be offered on the next-generation LS. Based on the rumor, the LC 500h would have a revised version of the GS 450h’s hybrid powertrain using a redesigned engine and hybrid system. Lyons reports the LC 500h could have a 3.5 V6 engine with 308hp and an electric motor with 217hp, producing a combined 470 horsepower. As the all-new LC 500 and LC 500h will debut in production form at Detroit we can look forward to a hot ‘F’ version in 2018, a coupe rumoured to be fitted with a circa-450kW (603hp) 4.0-litre V8 boosted by twin electric turbochargers. LEONWEST: Sounds brilliant. If the lcf rumours are ture, then how about the Rcf#gsf use that 4.0 twin turbo? Lexus Cohen: I am trying my best to like this, but it's not happening.